A paradise for camping enthusiasts with over a thousand beaches, unspoilt nature and a subtle mix of Central European, Mediterranean and Eastern European culture... Does that sound too good to be true? We can assure you it’s not. If you’ve never considered a trip through Croatia, now is the time to change your mind. It may not be the first country that comes to mind when planning your camping trip, but rest assured: Croatia has a lot to offer. During the summer months, temperatures are between 25 and 30 degrees Celsius, which makes it very suitable for a sun holiday. It’s ideal for nature lovers as well: from a long coastline and many islands to waterfalls, cliffs, rivers, hills and mountains; the diversity of the country’s flora and fauna is endless. Enough to see, do and experience, we’d say. Is there a better way to do so than with a motorhome? We don’t think so, and that’s why we’ve laid out a fabulous camping route through Croatia for you. Before you start your trip through Croatia, you’ll cross Germany, Austria and Slovenia. It’s possible to complete the drive to Croatia in one sitting, but we’ve planned out a stopover in Neckarsulm (Germany), just in case. The coast of the Croatian mainland is about 2000 kilometres long and has many beautiful beaches and idyllic bays with an azure blue sea. Apart from the clear water, the beaches are usually dotted with beautiful cliffs. The Istrian landscape is hilly, and slowly transitions into mountainous terrain. The trip starts in Poreč, an atmospheric harbor town that’s almost 2000 years old. In and around Poreč, you can find many campsites and parking places for motorhomes (see Parking Poreč). Did you find a spot for your motorhome? Go for a relaxed stroll along the boulevard and sit down on one of the terraces. You’ll encounter many ice-cream parlours in the streets of Poreč, where the vendors work their magic and create the most special concoctions out of ice cream. Don’t forget to pay a visit to the basilisk of Euphrasius and the city museum, too. 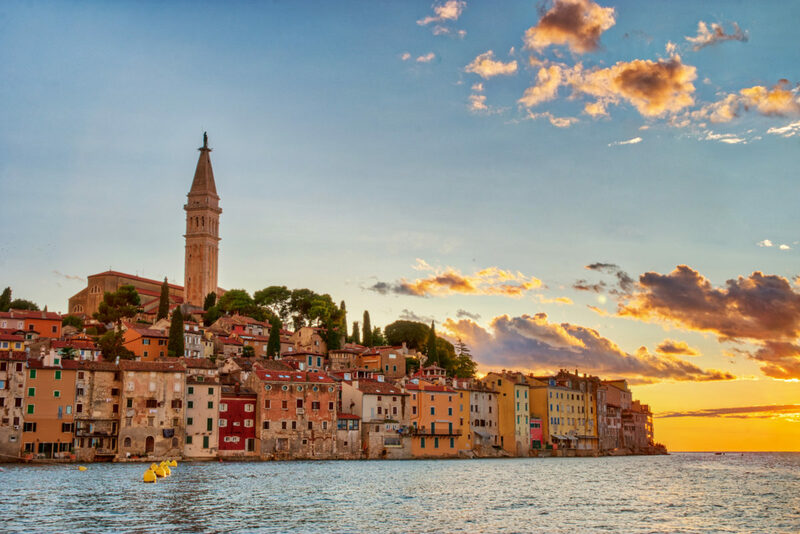 A little more to the south is Rovinj, the next stop on our Croatian camping route. The many old streets give Rovinj a cozy vibe. Walk through the alleys to the famed Saint Eufemia church that reaches out high above the city. Climb it’s tower for the best view! 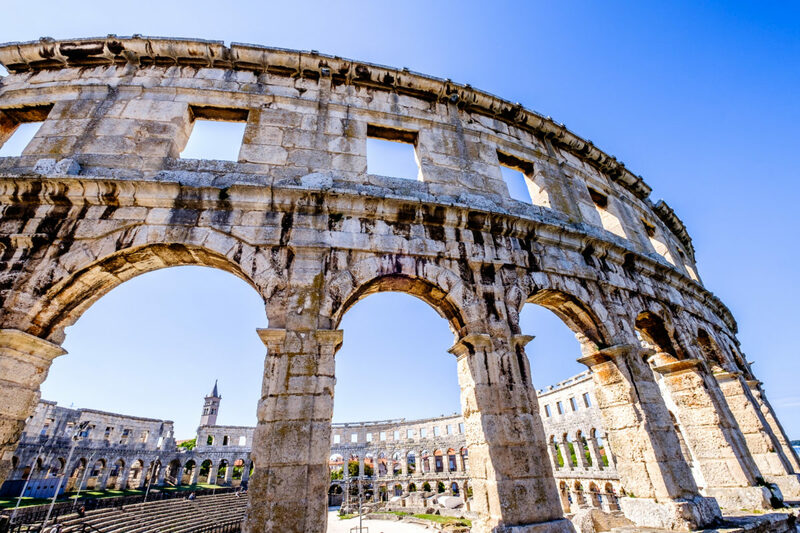 The amphitheatre in Pula is a beautiful landmark to visit en route through Croatia. In Roman times, gladiators fought their battles here. Nowadays, many concerts, operas and theatre plays are organized in this theatre during the summer. From Pula we go on to Sveti Juraj. Along the road, try to make a pitstop at Hum: the smallest city in the world, with only 30 inhabitants! In spite of the size, Hum has many wonderful sights for you to see. For nature lovers, Croatia has pretty much everything one’s heart desires. The beauties of nature can be admired in one of the many nature parks with impressive walking routes. Approximately half an hour away from Sveti Juraj is nature park Velebit. The location of this park is unique: there is hardly anywhere else where you’ll find mountains that close to the sea. This nature park is home to both the largest mountain range as well as the deepest cave of Croatia. Take a hike, or let the rough nature soak in on a Jeep safari. Onwards to the more southern Zadar it is, where two works of art by Nikola Bašic are the most famous attractions. The Greeting to the Sun consists of three hundred multi-layered glass plates with solar panels underneath. The energy that is stored during the day produces an intricate spectacle of colors at night. Sea Organ (“Morske Orgulje” in Croatian) turns the boulevard into one big musical instrument: the steps of the boulevard contain organ pipes and make music when the sea wind blows through the pipes. Well worth the visit! Another very special sight in Zadar is the impressive sunset, one not to miss! 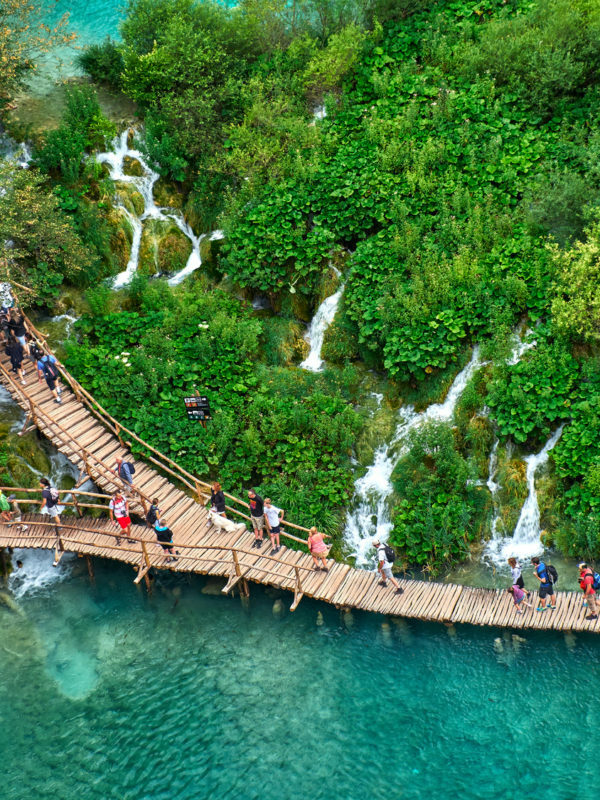 Get overwhelmed by nature in National Park Plitvice, the most visited park in Croatia. This has a reason: the park consists of six enchanting lakes that are interconnected by 92(!) waterfalls. Admire the scenic beauty on a walking trail of your choice. They vary from an hour or two to even eight hours, so there’s something for everyone! It takes about an hour and a half to reach Plitvice from Zadar. With a coastal route you can’t skip the beaches, of course. The many beautiful beaches of Poreč, Rovinj, Pula and Zadar are well worth a visit. There are many hidden or abandoned beaches to be found for when you’re in need of a little extra privacy. That’s one of the advantages of a coastline of several kilometres long; you’ll always find a spot all to yourself in one of the secluded bays. Croatia is also rich with a legion of islands, which are fun to visit for a day. Boat services between the mainland and the islands run throughout the day, and the islands Krk, Murter and Pag are even reachable by bridge! Then, the end of your trip approaches. On the way back, have a stopover in Günzburg. Do you have an appetite for thrills? Real daredevils can stop at the Kačjak Zip Line in Croatia, a 35 meter high traverse above the sea with a stunning view.